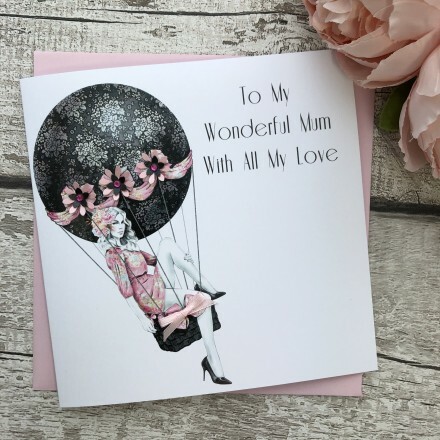 A beautifully whimsical card, up, up and away on Mothers Day. This pretty Mothers day card is perfect for you to send your love on Mothering Sunday. A pretty design featuring a stunning hot air balloon, finished with jeweled shimmering flowers, gems and hand tied satin bow. A personalised mothers day card is quite special to receive, a gift in itself.